SMRT Bus Service 979 is a trunk service plying from Bukit Panjang and looping at Choa Chu Kang Crescent within the Yew Tee estate. It passes through Woodlands Road, Stagmont Ring, Choa Chu Kang Street 52 and Yew Tee MRT. Launched on 27 December 2015 in tandem with the opening of Downtown Line Stage 2 (Bukit Panjang – Rochor), it is the fifty-third (53rd) bus service to be introduced under the Bus Service Enhancement Programme (BSEP). 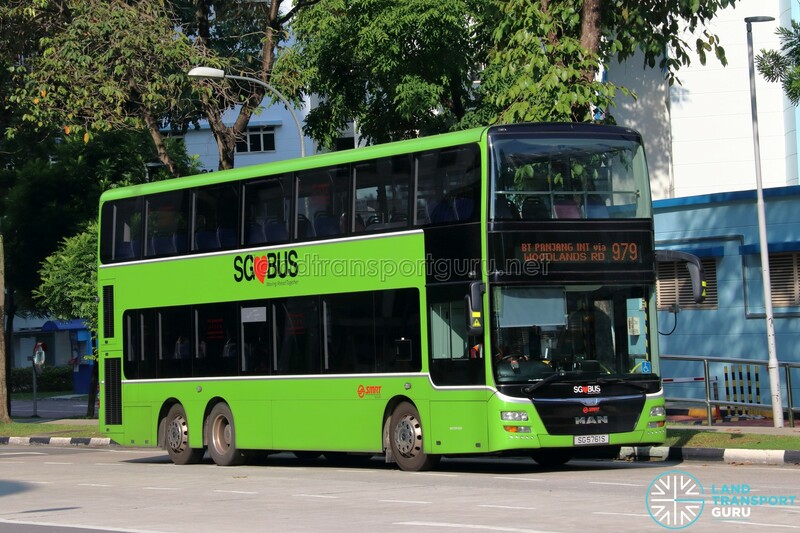 Service 979 is a residential trunk route serving within the housing estates of Yew Tee, connecting housing blocks along Choa Chu Kang Street 52 and Choa Chu Kang Crescent with connections to key transport nodes at Yew Tee MRT, as well as Bukit Panjang MRT / LRT. 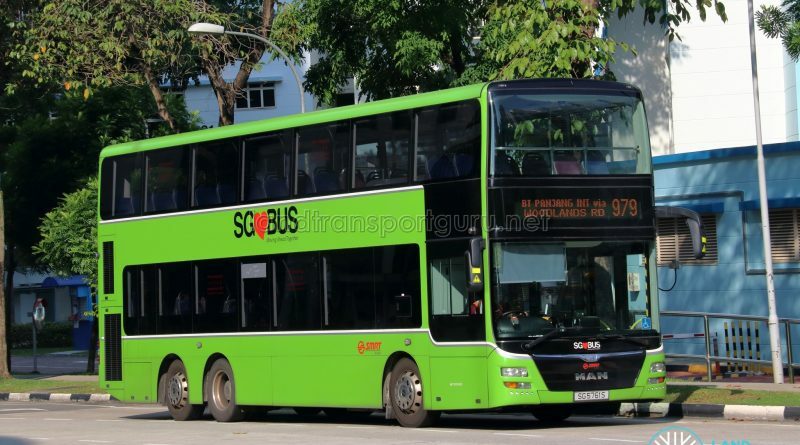 The route serves schools such as De La Salle School, and community amenities such as Bukit Panjang Plaza, Junction 10, Yew Tee Point, Limbang Shopping Centre and Yew Tee Community Building. It duplicates SMRT Feeder Service 302 between Choa Chu Kang Street 52 and its looping point. This service is the fifty-third (53rd) bus service to be introduced under the Bus Service Enhancement Programme (BSEP) and is launched as part of the DTL2 Bukit Panjang Bus Service Enhancements in tandem with the opening of Downtown Line Stage 2. Additionally, this provides a vital link for Yew Tee residents to Bukit Panjang, the Downtown Line and thereafter to other towns and the City. Previously residents had to pass through Yew Tee or Choa Chu Kang if they rely solely on Service 302. 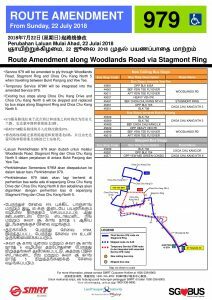 Service 979 was amended to ply Stagmont Ring, Choa Chu Kang Link & Choa Chu Kang North 5 instead of KJE from 22 July 2018, after road widening and modification works at the junction of Woodlands Road and Stagmont Ring was completed on 1 July 2018. This increases coverage along Choa Chu Kang North 5. As a result, temporary Bus Service 979M was withdrawn on the same day of the amendment. 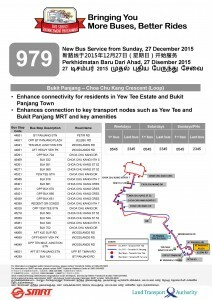 The amended route covers part of Service 979M’s lost sector along Choa Chu Kang North 5. Bus Service 979M was launched on 24 April 2016 to serve Choa Chu Kang North 5 residents with a direct link to Bukit Panjang MRT Station while modification works at the junction of Stagmont Ring & Woodlands Road were ongoing. Its last day of service on 21 July 2018, where Service 979 was amended to Stagmont Ring. Service 979 offered free rides on 27 December 2015. Member of Parliament for Marsiling-Yew Tee GRC, Mr Alex Yam Ziming attended the official launch, riding the service from Yew Tee MRT Station to Bukit Panjang via Choa Chu Kang Crescent. Despite a full fleet of rigid MAN NL323F buses, a bendy bus, SMB8032R, was dispatched for one special trip from Yew Tee MRT to carry the MP and his party. Should the return journey of 979 go back via Choa Chu Kang North 6 road instead of current route. This will save some time for the passengers and is also help the residents of those who stay in this area who now nothing after 979M was taken out of service. Why bus 979 move so deliberately slow. Hmm hi.. This service why do not putting more double deck buses ? I know that u guys have two or one double deck for only peak hrs.. But sometime there is also quite many of the passenger boarding this bus during non peak.. Why cant it replace some of ur single deck to double deck ?